History of Greyhound: Map of Pacific Greyhound routes in 1935. A 1935 promotional map for Pacific Greyhound shows the long reach of the bus company, when its regular schedules were combined with routes of regional affiliates. Printed a few decades after the founding of the company that would become Greyhound, the map shows how quickly Americans took to the idea of interstate bus service. In a history of Greyhound published in Mental Floss, Gary Belsky writes that it was an older transit industry—the railroads—that gave buses a lift in the 1920s. Analyzing a post-WWI dip in ticket sales, railroads found that people who would previously have ridden a train were either buying cars or, if they couldn’t afford a train ticket, taking regional buses. By investing in buses and combining routes, railroad companies retained passengers. During the 1930s, appearances of Greyhound busses in popular culture put the mode of travel in the public eye. In It Happened One Night, characters played by Clark Gable and Claudette Colbert meet on a Greyhound bus. While the pair’s experience was sometimes less than smooth (in one scene, the coach gets mired in the mud), the romantic tone of the movie made travel on a Greyhound look appealing. 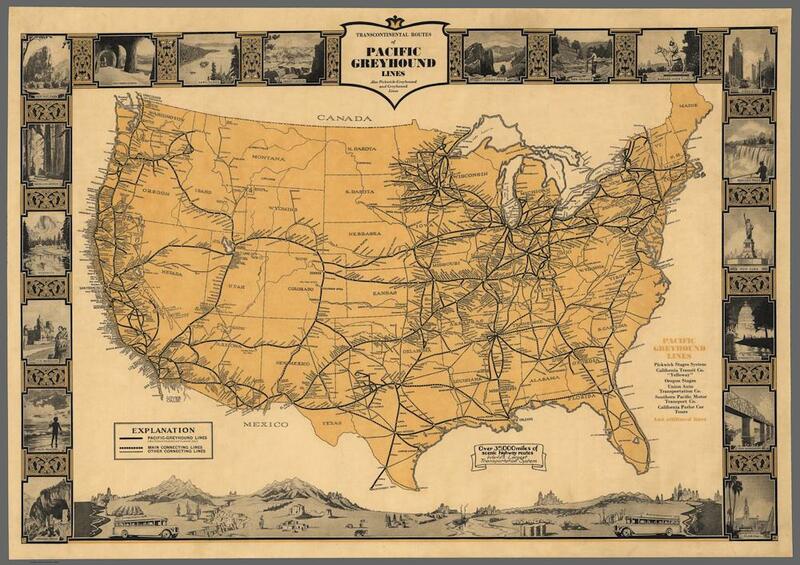 The border of this map, featuring the notable attractions of the United States represented in dignified black and white, echoes this positive vision of bus travel. I first saw this map in an exhibit about maps and American culture on the Digital Public Library of America’s website. Click on the image or visit the map’s page on the David Rumsey Map Collection’s website to zoom.